Many human diseases are caused by defective genes. All of these diseases are caused by a defect at a single gene locus. (The inheritance is recessive so both the maternal and paternal copies of the gene must be defective.) Is there any hope of introducing functioning genes into these patients to correct their disorder? Probably. Other diseases also have a genetic basis, but it appears that several genes must act in concert to produce the disease phenotype. The prospects of gene therapy in these cases seems far more remote. is able to make antibodies. It is a disease of young children because, until recently, the absence of an immune system left them prey to infections that ultimately killed them. About 25% of the cases of SCID are the result of the child being homozygous for a defective gene encoding the enzyme adenosine deaminase (ADA). The normal catabolism of purines is deficient, and this is particularly toxic for T cells and B cells. Raise the child in a strictly germfree environment: all food, water, and air to be sterilized. David, the "bubble boy" from Houston, survived this way until he was 12 years old. even though the child cannot reject the transplant (the child has no immune system), T cells in the transplant (unless the donor was an identical twin) can attack the cells of the child producing graft-versus-host disease. the donor cells may be infected with a virus which could overwhelm the recipient before his or her immune system was restored. (David received a bone marrow transplant from his sister, but she, like many people, had been infected earlier with the Epstein-Barr virus (the cause of "mono")). The virus was still present in the cells she donated, and killed her brother. what about giving the patient functioning ADA genes; that is, gene therapy? The gene must be identified and cloned.This has been done for the ADA gene. It must be inserted in cells that can take up long-term residence in the patient. So far, this means removing the patient's own cells, treating them in tissue culture, and then returning them to the patient. It must be inserted in the DNA so that it will be expressed adequately; that is, transcribed and translated with sufficient efficiency that worthwhile amounts of the enzyme are produced. All these requirements seem to have been met for SCID therapy using a retrovirus as the gene vector. Retroviruses have several advantages for introducing genes into human cells. Their envelope protein enables the virus to infect human cells. RNA copies of the human ADA gene can be incorporated into the retroviral genome using a packaging cell. inverted repeats ("R") at each end; to aid insertion of the DNA copies into the DNA of the target cell. an RNA copy of the retroviral gag, pol, and env genes but with no packaging signal (so these genes cannot be incorporated in fresh viral particles). none of the genes (gag, pol, env) that would enable the virus to replicate in its new host. Once the virus has infected the target cells, this RNA is reverse transcribed into DNA and inserted into the chromosomal DNA of the host. What to use for target cells? The first attempts at gene therapy for SCID children (in 1990), used their own T cells (produced following ADA-PEG therapy) as the target cells. But someday there may be a way to make genetically-engineered T cells live indefinitely by getting them to express telomerase. See the discussion. In June of 2002, a team of Italian and Israeli doctors reported on two young SCID patients that were treated with their own blood stem cells that had been transformed in vitro with a retroviral vector carrying the ADA gene. After a year, both children had fully-functioning immune systems (T, B, and NK cells) and were able to live normal lives without any need for treatment with ADA-PEG or immune globulin (IG). The doctors attribute their success to first destroying some of the bone marrow cells of their patients to "make room" for the transformed cells. Nine years later (August 2011) these two patients were still thriving and had been joined by many other successfully-treated children most of whom no longer need to take ADA-PEG. These successes led in 2016 to the approval by the European Union of this gene therapy. Gene therapy has also succeeded for 20 baby boys who suffered from another form of severe combined immunodeficiency called X-linked SCID because it is caused by a mutated X-linked gene encoding a subunit — called γc (gamma-c) — of the receptor for several interleukins, including interleukin-7 (IL-7). IL-7 is essential for converting blood stem cells into the progenitors of T cells. [View]. Boys with X-linked SCID can make normal B cells, but because B cells need T-helper cells to function, these boys could make neither cell-mediated nor antibody-mediated immune responses and had to live in a sterile bubble before their treatment. returned the treated cells to each donor. have responded to several childhood immunizations, including diphtheria, tetanus and polio by producing both T cells and antibodies specific for these agents. Antibody production is sufficiently good that most of the boys have no need for periodic infusions of immune globulin (IG). in one case caused by a proliferating clone of γδ T cells in which the vector has inserted itself in a gene (on chromosome 11) implicated in some cases of acute lymphoblastic leukemia (ALL). in a second case, the leukemia was of αβ T cells. β-thalassemia is an inherited disease. The most severe cases result from mutations in both copies of the gene encoding the beta chain of hemoglobin. Many causative mutations have been identified, and most lead to a failure to make any beta chains. The resulting hemoglobin functions poorly and the person requires frequent blood transfusions. In the 16 September 2010 issue of Nature, Cavazzana-Calvo (and many colleagues) report a single case of successful gene therapy for this disorder. Their patient was an 18-year old male. Harvest blood stem cells from the patient. alterations to the vector to make it safe. After sufficient chemotherapy to "make room" for them, the patient was injected with these cells. The result: Almost three years later, the patient is well and no longer requires periodic blood transfusions. One-third of his hemoglobin is now manufactured by the red-cell precursors descended from the gene-altered stem cells. several babies born with an inherited lysosomal storage disease or Wiskott-Aldrich syndrome (another type of immune deficiency) have, up to two years after treatment with a retroviral vector containing the intact gene, not shown any signs of their disorders (reported in the 23 August 2013 issue of Science). Some 15 years after it was shown to work in mice, a 13-year-old boy with sickle cell disease has been free of symptoms for 15 months (as of March 2017) since receiving an infusion of his own blood stem cells expressing a gene for a sickling-resistant hemoglobin beta chain. As of that time, some 50% of the hemoglobin in his circulating red cells was sickling-resistant (reported in the 2 March 2017 issue of The New England Journal of Medicine). Junctional epidermolysis bullosa (JEB) is an inherited skin disorder. In severe cases, the patient's epidermis separates from the dermis forming extensive blisters and exposing the dermis to bacterial infections. JEB is caused by inherited mutations in one of three genes — LAMA3, LAMB3, and LAMC2 — which encode the 3 subunits of laminin-332. Homozygous mutations reduce or eliminate synthesis of laminin-332 a critical component of the hemidesmosomes that anchor the epidermis to the underlying basal lamina and dermis. In 2015, a seven-year old boy with a severe case of JEB — caused by a pair of mutant LAMB3 genes — began a trial of gene therapy. Samples of his skin were removed. These were exposed to a retroviral vector containing the cDNA encoding the normal LAMB3 protein. Epidermal stem cells in his skin samples took up the vector. The transformed tissue was grown into sheets of epidermal cells. Over several operations, these sheets were grafted onto the boy until some 80% of his body was covered by them. 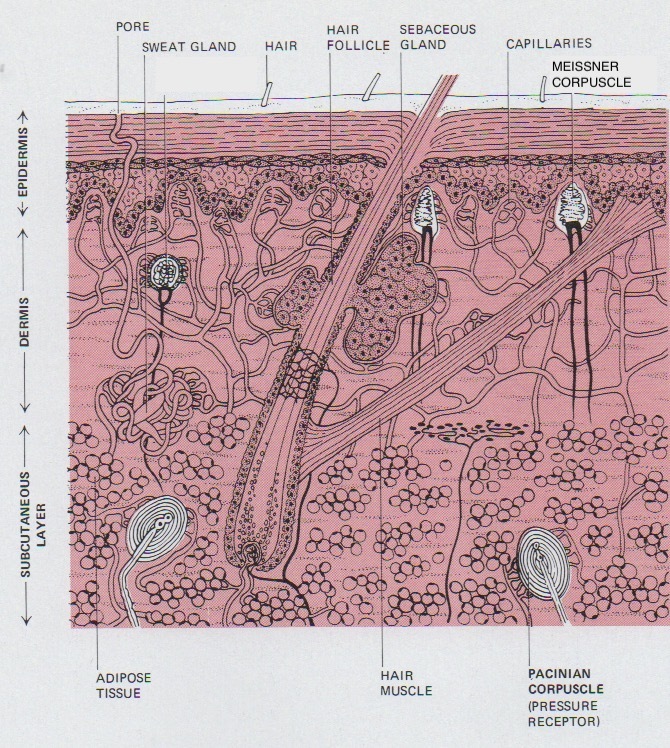 The sheets of cells integrated with the underlying dermis. Almost two years after the last transplant, his skin is now normal, and he is able to enjoy a quality of life denied him before. Adenoviruses are human pathogens responsible for some cases of the human "cold". Modified versions of two strains are currently being used as vectors in gene therapy trials. Unlike retroviral vectors, they do not integrate into the host genome and thus should not be able to disrupt host genes (It was such disruption that caused some X-linked SCID patients treated with a retroviral vector to develop leukemia). They can infect nondividing cells with high efficiency. They elicit a powerful immune response, both by T cells and by B cells (antibodies) so repeated doses soon lose their effectiveness. Many people already have antibodies against the virus from earlier "colds", and these can inactivate the vector at the outset. A recent trial of an HIV vaccine using an adenovirus as the vector was halted when it was found not only not to be effective but, in people with preexisting high levels of anti-adenovirus antibodies, may have even increased their susceptibility to HIV. Link to discussions of other approaches to gene therapy that are being tried.